Doesn’t travel to new places fascinates you? Doesn’t travel feel like fulfilling the purpose of life?Being into the travel profession, God has blessed me with the opportunity to see the world, I have come in. 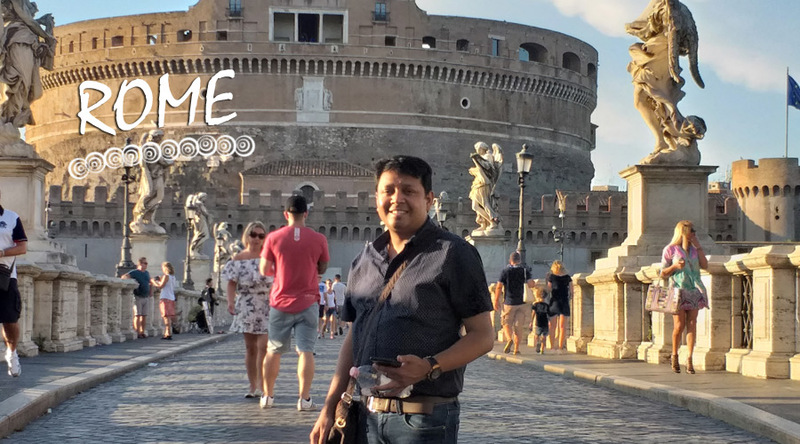 With my new blog series – Europe Diary, I would like to share my travel experience to Europe along with a few travel tips which will help you in planning your vacay there. My Job as a CEO of Travel company “Tripplanners” makes my travel a lot more official but I had always wanted to have a family trip to Europe. One of the ideas behind having a family trip is to get a better understanding to plan a family trip for our clients. I and my wife “Vinita” both are fond of traveling but always remain busy with our daily chores, still, we always seek a chance to pack our bags and head to some new destinations. I have two daughters Arunika & Amyra, 11yrs and 2 yrs respectively. In the month of August, As soon as Arunika’s exams got over and I was also relieved from the high peak travel season, I immediately applied for Schengen visa and made all necessary arrangements to our much-awaited vacation to Europe. We flew on 12th August morning by Etihad Airlines and reached Rome in a pleasant afternoon as the first place to uncover with Italy, Switzerland, Prague, Germany, Amsterdam, Belgium, France and Paris among the other places of our itinerary. As, we landed at Leonardo da Vinci–Fiumicino Airport. our hearts thronged with excitement to indulge in the Roman experience. After landing, we took a 2 mins train to reach the baggage claim counter to collect our backpacks and took a taxi – Uber to our hotel. Taxi in Europe is quite expensive. Our ride from Airport to the hotel cost us around 50 Euros. So, I recommend booking your airport transfers in advance. Through all the way to our hotel, the lanes and alleys of Rome were portraying glimpses from the history and the first glance of the city made us realize that our visit to Rome is going to be a vintage experience. 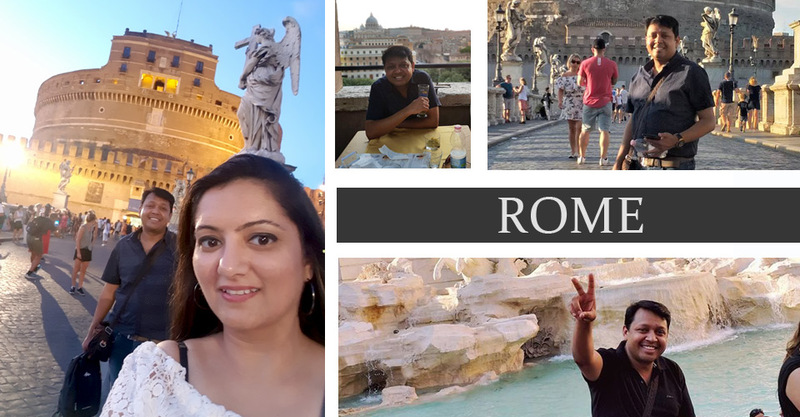 Moreover christened as one of the world’s most romantic city, Rome was the perfect getaway for me and my wife to unwind ourselves from the chaotic city life. Rome, Italy’s sensual capital and world’s most romantic and inspiring cities is a journey that led us through the era of Roman civilization in the 8th century BC. It took us through the vintage corners of the city depicting awe-inspiring art and vivacious street life. As we reached our hotel “Antico Palazzo Rospigliosi”, the location of it added another feather to our excitement as it was near to the Colosseum. Room size was small but manageable. After reaching the hotel, we took rest for a while and then we walked to the Colosseum but unfortunately Colosseum was about to close so we decided to start exploring the city on the Hop On Hop Off ( HOHO ) Bus. The HOHO bus service is very amazing with an audio tour guide that will be provided to you for your entire bus tour. The audio tour guide will brief you about the main attractions while you explore them. So,when in Rome, the HOHO Bus is highly recommendable as it makes the journey of exploring Rome much easier. It costs you around 25 Euro Per Person for unlimited rides for 24 hrs. You can choose your preferred language while selecting the audio tour guide as for Indians, selecting the Hindi language is an added advantage offered by the bus companies. Navigating through the vibrant streets of Rome in the bus was unfolding chapters from history with monuments, statues, historical buildings and Colosseum adorning the entire city. It is to remember that the bus tour does not cover the entry ticket prices and hence you need to buy those separately. Our first sightseeing in Rome started with the tour of the Castel Saint Angelo. We are awe-struck to see such an enormous castle with exquisite and fine sculptures adorning the walls of it. We took a boat tour there which took us around the entire castle as if we were living some beautiful time from the chapters of a fairy tale. 13th Aug: Our next day in Rome, started at around 6:30 a.m. in the morning. Days are quite longer there and in the evening till 8:30 p.m. sunlight brightly gorges through the buildings. In the month of August also the weather was very hot with the temperature at around 35 degree Celsius. So, it is advisable to carry light clothes if you want to roam around comfortably. Rome looks more beautiful in the evening with lights adorning the vivacious city life. Today was planned for the most awaiting trip to the Vatican City and Colosseum in Hop on Hop Off bus tour with few other major attractions. Our bus first halted at the Vatican City, the first destination of our bus tour. There were a mad rush and a nonending queue to enter Vatican City, I have managed to get skip the line ticket to the Vatican. It is highly recommended to always pre-purchase Skip the line tickets for both Vatican City & Colosseum otherwise you would end up standing in the long queue whole day. As a hub of the world’s greatest art collection, The Vatican Museum boasts as the pride of Rome. We are mesmerized to see the exhibits at each corner of the gigantic museum displaying antiques and precious historical item starting from Egyptian mummies and Etrusan bronze s to ancient busts and modern painting which will make the chapters of history alive in front of you. Some of the spectacular collections in Museo Pio-Clementino and Sistine Chapel enhance the value of the museum. Hovering through each historical items kept us mesmerized and took us through the chapters of Roman civilization. If you are not too interested to know about the history of the place than I would recommend you to not to take a guide, which will save your money and time both. The next attraction that we covered was St. Peter’s Basilica. As one of Italy’s richest and largest churches, one cannot miss seeing an enormous church like St. Peter’s in this city of churches. We were amazed to see such a huge area that the church covers. It stands boastfully in the heart of Rome with spectacular artworks preserving three of Italy’s masterpieces, Michelangelo’s Pietà and Bernini’s 29m-high baldachin. It took us two and a half hours to cover this gigantic church. Strict dress codes are enforced with no exposure of legs or bare shoulders. So, travelers should keep this in mind before visiting the church. Next, we visited the Colosseum. This gladiator arena is one of the most thrilling experiences of Rome where all the scenes from the Roman pictures showing the gladiator fighting came alive in front of us. The huge amphitheater with 50,000 tiered seating encircling the arena reminded us of the movies on ancient Roman ages. Though the tour of the Colosseum was a tiring one each corner of this amphitheater unfolded new surprises for us as we explored each and every passing corner of the place. As the Colosseum covers a huge area, so travelers might have to walk for long. Our hop on hop off bus tour was like a roller coaster ride which took us through some of the ancient chapters of the Roman civilization. We were contented from our heart to have chosen this bus tour otherwise it would have been difficult for us to have covered all the major attractions of Rome and we realized that the ideal way to cover Rome is via the hop on hop off bus. Though the city tour is on a bus, still a lot of walking is required to explore the attractions. Small children and aged people might find it difficult to walk. You will find a few Indian restaurants if you really can’t stay without your home cuisine. The tour of Rome ended on a pleasant note and now the time has arrived to hop on to our next destination, Florence. A new city was waiting for us, so a new chapter was waiting to be uncovered.